"We're really invested in this series of movies, we really love 'em." And does it show! You can feel the passion. Damn it, you can almost taste it. Without so much as a tap on Bond's shoulder, Jason Bourne came along. Is the 'Ja' of Jason/James and the 'Bo' of Bourne/Bond just a coincidence? He asked "Who am I?" and over five and a half glorious hours, has proved himself to be one of the most original and exciting secret agents in film history. I'm not being over the top here. Here is a hero who thinks and relies on wits rather than twits who need their heroes to commercially perform by shackling them with commercial tie-ins, Eurotrash bad guys and an indestructibility based on the surrealism movement (which would be yellow if anyone really appreciates jokes like that anymore. Or was it fish?). To urge you to have one of the best cinematic night out's this summer, I'm not going to take up much of your time. 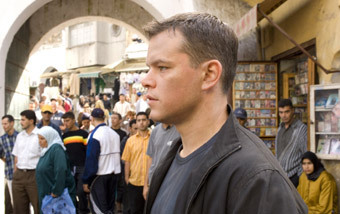 In Identity, Bourne found a traveling companion and a whole slew of folks who wished him dead. In Supremacy, the filmmakers gave him the only real motivation Bourne needed - the death of that companion from a random shot aimed at Bourne. A good friend of mine said, not unreasonably, that this sacrifice killed the film for him but for Bourne to make all that effort at the tail of the movie, shot and bleeding to simply apologize to the daughter of two of his victims... Extraordinary. Suddenly it clicked - Jason Bourne was the US of A. And there was a lot of apologizing to do. In Ultimatum, we are told in the trailer, Bourne is coming home hence the appalling sub-heading above for which I offer no apology being aware of Tom Jones's oeuvre and the glory that is the director's surname. Stylistically, the camerawork is still nervous and hunted, jiggling from one jagged jump cut to the next as per Doug Limon's first installment. Paul Greengrass's direction - literally as in keeping the knowledge of where we are, who we are with and why - is first rate despite my distaste for the visual ticks of recent movies. In the Bourne series it simply works. It's as if the style is a garment that only really shines on the right body shape. On Bourne, it's tailor made. The acting is un-showy, unfussy and markedly believable. Damon has been a revelation in this trilogy given his rather geeky wannabe-cool guy as he's always played in the Ocean's Trilogy. His determination level has raised his game - he's in the home stretch after all - and Damon pulls off another riveting physical performance. Damon is backed up by Joan Allen, returning as Pamela Landy, the only agency worker with smarts and compassion. They get a short scene together and it's oddly touching. The ever earnest (and in this case creepy) David Strathaim slithers into "Kill everyone mode" a little too easily but then there are a few secrets he needs to stay secret. Paddy Considine turns up as a journalist in over his vulnerable head and we find out that dear, ultra-capable Jason Bourne is a Guardian reader! How much did that newspaper pay for that association? It's gorgeous, the polarized nature inherent in the ultra right wing job (assassin to protect Americans and American interests) and the fiercely independent, left leaning bastion of all that this country of ours would dearly love to be. The trouble with real international espionage and crusading journalists is that the latter tend to forget how bloody dangerous the former can be. The action picks off almost literally from Bourne's apology and walk away at the end of Supremacy. Google Supremacy's alternate ending on You Tube (I'm told it's an Easter Egg on the DVD but don't have it to hand). It's quite a shock and a small blip of silliness that the writer in Matt Damon reacted against. His instincts were right. You don't spend four hours with a character who can get out of any jam and expect a hospital room to present any great obstacle in escaping from. His rewritten New York dénoument is far more effective but that's a timeline not included in Ultimatum. Bourne believes a journalist is getting close to discovering what the assassin programme 'Treadstone' is all about. Clandestine operations to serve to common good (define 'common'!) are not necessarily inherently evil or politically unwise but then it depends where the line is drawn and in CIA terms, that line is a football field wide. People are frighteningly easily ear-marked for assassination (assassins are 'assets' in Ultmatum) and if in Bourne's sights, the assets get their assets kicked. Again (as in my review for Supremacy), I was reminded of the classic Connery/Shaw scrap on the Orient Express. The fight with the 'asset' using what's to hand (towels and hardback books) is electrifying and sets a benchmark other movies must now acknowledge. It is to the action genre what The Matrix was to science fiction - a sound raising of the bar which the producers of Bond took to heart despite Casino's shameless product placement. Despite the odds (of course) Bourne outwits his hunters and ends up at where it all began. Playing far from the avuncular storyteller of recent appearances, Albert Finney is Albert Hirsch, the man who indoctrinated Bourne and the way in which this is done (and remembered) is suitably shocking. It seems Jason was born when his reason caved in to his belief that anything is justifiable to 'save American lives'. It's a telling moment and the closed parenthesis to the apology offered implicitly by Bourne's return to his former identity, David Webb. You are unlikely to find a better Hollywood thriller out there in the last ten years that didn't have the word 'Bourne' in its title. Go.